A Positive PR Spin appears to be the outcome of choice for at least one of the folks who appeared in Richard Prince’s controversial display at the Frieze Art Fair in NYC earlier this summer. (The controversial artwork consisted of enlarged screenshots of people’s Instagram photos used without warning or permission – reportedly selling for $90,000 a piece. Blogged about here at http://wp.me/p10nNq-I0). 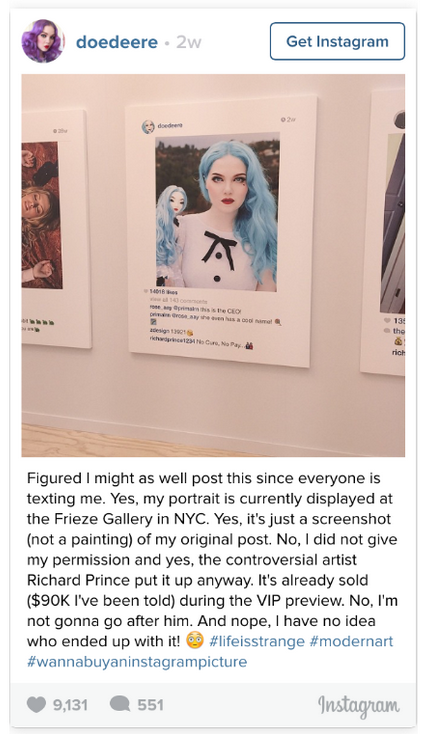 Lo and behold, the Instagram photo of Ms. Deere (pictured to the right) that Richard Prince put up for sale at the Frieze Art Fair was a photo that Ms. Deere posted to Instagram to promote a friend who makes beautiful, hand-crafted dolls (notice the doll in the photo to her right). 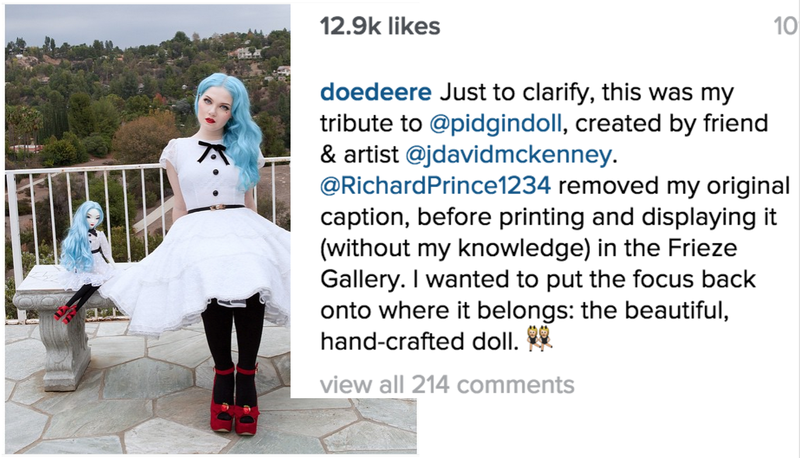 The silver lining to Richard Prince’s use of Ms. Deere’s Instagram photo is that the photo was seen by even more folks… garnering more attention and notoriety… which Ms. Deere has been able to spin and re-share on social media for additional promotion of her doll maker friend. Below is a photo and text shared by Ms. Deere recently on Instagram to refocus folks attention to the promotion of her doll maker friend. (As of today, Ms. Deere has 348K followers on Instagram). Fingers crossed that Ms. Deere and her doll maker friend each make at least an additional $90,000. This post is a valentine for my mom… who will be lecturing on this topic for other authors and photographers over the weekend. Keeping tabs on who is using your copyright protected images is important because, it helps you control your photos, preserve your licensing revenue streams and protects the copyright vested in your work. 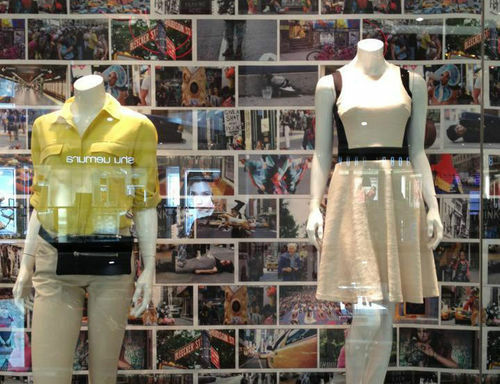 One simple way to search for uses of your photographs online is by using Google Images. Google Images allows a Google search to be run on an image, instead of a ‘text search term’. It’s easy; you just drag an image into the search field and click ‘Search Images’. Recent MySpace enhancements include a new super-duper search field which makes it easier to search for misappropriated photographs and unauthorized uses of copyright protected photographs. The search field on MySpace now gives options for searching by category. ‘Photographs’ is one of the search category options and with this new tool it is easy to launch a broad search of all photos posted to MySpace with a common word or words in their name or title. Since a lot of MySpace users tag photographs that they post to their MySpace page in the same way that the original photographer, author, artist, or business titled them… it’s easy to find these poached photos by running a MySpace search of Photographs with the photographers name, the title of the photograph or the business that the photo is associated with. If you have published photographs …take a minute to search for any unauthorized uses of your photos on MySpace with their enhanced search tool.